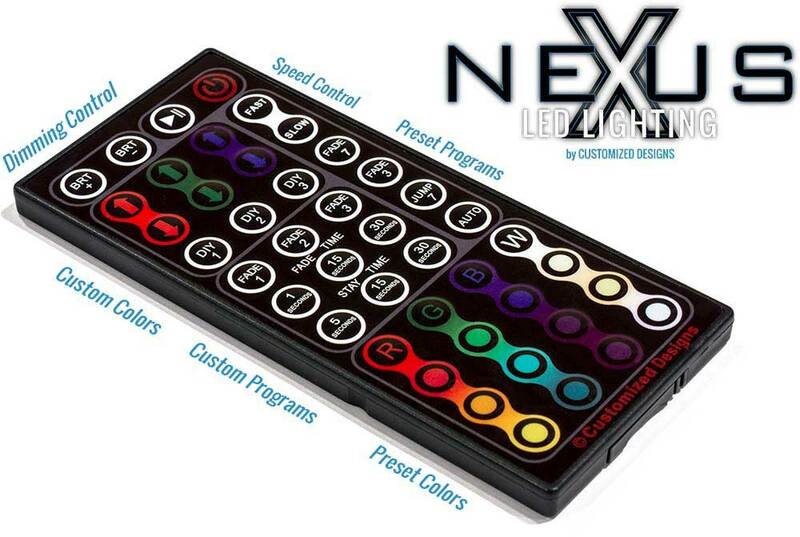 Customized Designs is proud to introduce it’s brand new LED Lighting creation, the Nexus remote control LED lighting system. Easily the most advanced LED remote control of it’s kind on the market today. This system is a year in the making and utilizes our own unique and custom programming and stylish graphics. This remote is truly one of a kind, comes with all of our products at no extra charge and can’t be found anywhere but here or through one of our authorized resellers! -The most notable feature and what makes this remote one of a kind is the ability to create your own custom color changing modes without the need for special software or hardware. Instead of being stuck with the same old generic fade sequences, unable to control which colors pop up next, you’re able to pick and choose which colors you want to incorporate into your color changing program. Not only can you choose which colors you want but you can decide how long it will stay on a certain color and how long it will spend transitioning to the next!